If you grew up skiing in the Northwest it might be tempting to take our snow for granted. Few regions in the country — or even the world — see as much snow as we experience during a typical winter. While our snow volume is a joy, it can also be a beast to be tamed, especially headed into spring when temperatures warm up a bit. Locals lovingly call it “Cascade Concrete” for its tendency to be thick and heavy. But there’s a silver lining to all that chunk: There’s usually plenty of new snow. If Northwest skiing is new to you, you’re in for some fun surprises. There are also challenges, especially if you learned how to ride on dry powder. Here’s an honest look at the good, the bad and the unique aspects to skiing Cascade Concrete. At a recent outing at Stevens Pass I encountered a good example of Northwest conditions. An unexpected 5 inches fell overnight, leaving a rich blanket of velvet to cut through. I met Brian Foster, of Leavenworth, on my first chairlift ride, and together we spent our day sniffing out long chutes of undisturbed carpets. We took turns bombing through open meadows without fear of tripping on something below, winding among pockets of young evergreens and dropping into technical nerve-wracking plummets. Even on the steepest terrain the snow seemed to go on forever. 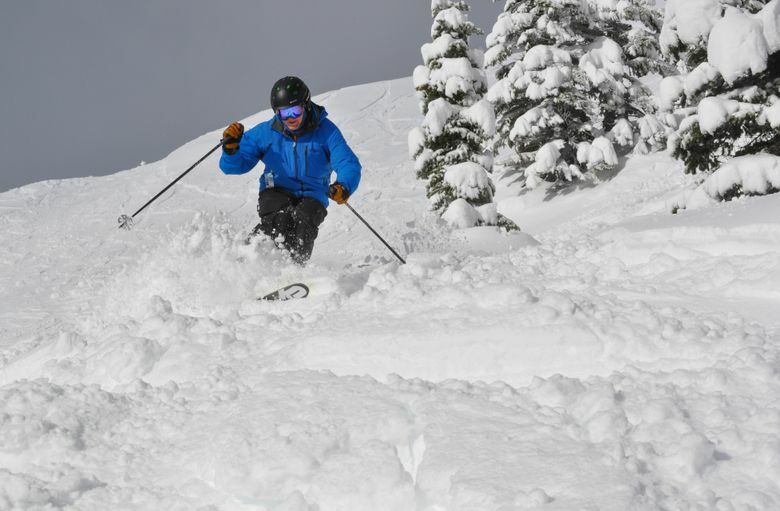 “Six inches of new here feels like a bottomless day,” says Stevens Pass Ski Technician Patrick McGarry, who hails from the East Coast and spent several seasons in Montana. “In the Rockies, you sink and hit stumps and rocks,” he says. “I quite like the heavier snow because it covers over the rocks and sticks on the steeper sections,” says Crystal Mountain Ski Patrol director Kim Kircher. “What we get to ski at Crystal would be too dangerous in the Rocky Mountains. Our weather makes our snowpack more consolidated and safer from an avalanche perspective. Due to the warmer snow temperatures, we don’t often suffer from deeper slab instability that can happen at the beginning of the season,” she says. Roberts decided to base Lithic in Washington because he wanted to ski in a place that had consistent snow. He built skis in Tahoe for three and a half years, and says that the snow there is dry but it’s frequently lacking in volume. When he is skiing through deep Cascade powder, his friends in other states are often riding mountain bikes. OK, I’m just going to be honest here. It can rain. Occasionally a wet weather system will be too warm and your glorious thigh-deep powder will turn to sludgy garbage. 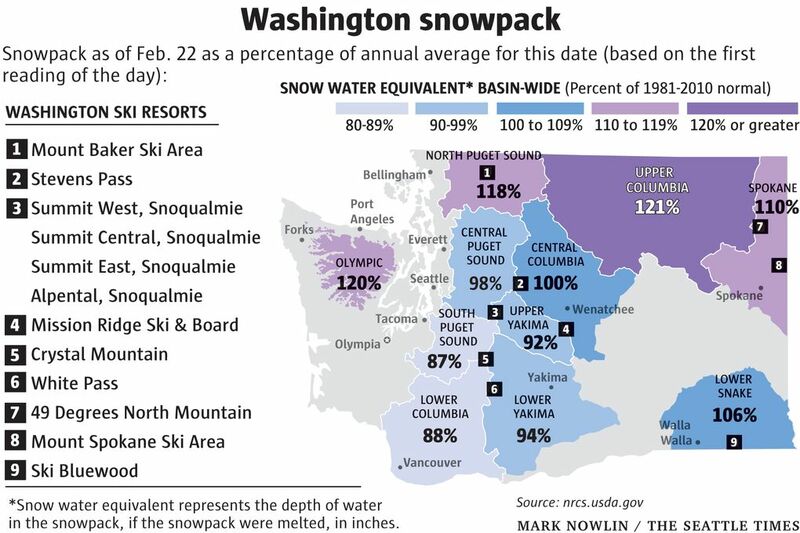 Another hard truth is that Snoqualmie Pass — the closest major resort to Seattle — is fairly low, at just over 3,000 feet, and especially prone to weather wipeouts. That inconsistency is probably why Washington is free of mega-resorts, says Roberts. Because who wants to fly somewhere for a ski vacation if there’s a chance it could rain? Those of us who live here can simply wait out the warm spells, which is why it’s important to learn to track the weather, says Kircher. When snow is wet and heavy, turning can take more effort. Skiers and boarders lean to ride farther back in the seat, pointing their tips up so they don’t get sucked under, says McGarry. Heavy snow isn’t a bad thing, it’s just different. Due to the high moisture content, Northwest snow tends to grip more and ride slower. That alters your technique on steep terrain. With reduced speeds over powder, you can cruise some terrifying steep runs without fear of picking up too much speed. “Look for untracked snow. As heavy snow gets cut up, it becomes more difficult to ski because you slow down and speed up. Instead, staying in the untracked snow keeps you going at the same speed,” advises Kircher. The silver lining to our freak rainstorms is that you can experience corn cycles. Rain followed by a cold snap can leave a top layer on groomers with round kernels of snow. If that happens the snow becomes forgiving and even novices carve the most amazing lush turns since the snow holds their edges, says McGarry. Until the 1990s skis were all basically the same shape: long, narrow and stiff. When snowboarding boomed it became possible to float over deep powder and skis grew wider to simulate what snowboards do. Crystal Mountain Ski Patrol director Kim Kircher recommends owning two pairs of skis: a fatter pair (around 100mm under foot) for the days with fresh snow, and a narrower pair for groomer days. While it may be tempting to select a fat jumbo ski, they can be hard on the knees once the snow gets tracked up. Casual skiers should look for all-mountain skis that handle a little bit of everything. Conditions can change fast, so it’s helpful to have something that can float over new powder but also maneuver on tracked-out snow or disorganized groomers. 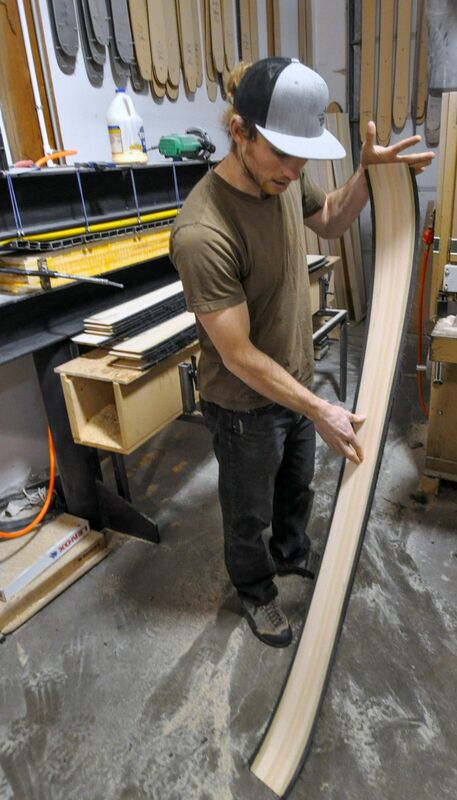 When in doubt, ski-makers such as Lithic will custom-build skis to suit your size and skiing style. See lithicskis.com. Freelance writer Jeff Layton lives in Chelan County. Follow his outdoor adventures at www.MarriedToAdventure.com.